I love that this is one of those projects that always makes me think. It gives me the opportunity to take a look at my life and see what things are really important, what I love, what I dislike (and potentially the chance to change those things), and how I am living from day to day. I love that many of you are changing up the project to make it fit your life. That is perfect. It is ok to have the same photos from day to day. That is part of our lives and part of the story that most of us live. It is ok to have some of the same words from day to day. Here's the thing: your routine may be the same but I bet your thoughts may be different. Why not include some of those in there as well. Or focus on something else like your gratitudes for the day or a list of some of the things you did at work. It does not have to be a list format of what you have done over the course of the day. I love that many of you are playing with and learning how to use your cameras more. Me too! That tip from Tracey the other day about changing your ISO (this is if you are shooting on P or manual I think...rather than my go-to running man) made a HUGE difference for me last night at the dark pool and this morning in the house. I love that many of you are using your blog to document your photos + words. I love that we all have very different lives but have something in common through our love of this creative process. Some of us work from home, others work in an office, others are stay at home moms, students, disabled, etc. We all have something to share in this process. Our stories are all important. I love that many of your are handing your cameras over to your spouses or your kids and involving them in the project. Avoiding burn out : Let yourself go in terms of feeling like you have to capture every little thing. Find a rhythm for yourself and go with it. We are mid-way through the project - keep going! Don't stress about the format: focus on the now. This project will come together. There is no right or wrong way. You can do this. A : I would just go ahead and add one next week. The main idea here is a specific week, but in reality, no one will ever know that you took it a week later. If it is an important part of your story right now then I would include it. Carrie : Do you think it would be weird to enlist my sitter in this endeavor? A : I love this idea. Why not? Jan : I love the calendar on the clipboard! Where did you get the calendar? A : That calendar was a download at marthastewart.com. You can find it here. but also the most interesting down the road. A : Great point Carol. I also think it is important to have a variety of views to showcase many of those cool things that often blend into the background. I love many of my photos from my parents that include all the crazy stuff in the background. When I approach a whole room I tend to find a corner, back myself in as far as I can and take a look through the viewfinder. I often will try all the corners of the room to see which one has the best light and which one can document the most. We have a small house with small rooms and it is a challenge to fit the whole room in a shot (a different lens would make this easier...but the ones I have are not wide-angle enough). Another idea to consider is to shoot one side of the room and then another and either put them together in your album or stitch them together in your photo-editing program. some of the past albums from your class that there was a calendar. A : Not sure yet. In the past I did use a calendar and in another year I did a square-punch collage of a bunch fo my favoites from the week. I am guessing I will lean that way. Niki : I was wondering when you use the trading card page protectors do you cut your pictures to fit or get them resized somewhere. A : I will probably just crop them to fit. it will be a good way to count my blessings when I am feeling blue. A : First off, I am so sorry for your loss. I think this is a really personal decision. I think that scrapbooking can be a way to grieve and can help in moving forward (when you are ready) but timing should come into play at some level. It sounds to me like you answered your own question in this case. Peace to you Michelle. Tracie : Can you share the recipe for the yummy looking pasta? A : Thanks Tracie - it is super easy: whole wheat penne pasta + sauce from Trader Joes (I think it was three-cheese). anything like a normal week would. Should that matter? I thought about postponing this project until I'm better so it can reflect our daily lives. Any thoughts on this? A : Here's the deal - there is no perfect week. "Normal" is whatever you are living right now. Stuff comes up all the time for all of us and it is all part of our story, a part of our normal. Obviously, the decision is totally up to you but I think it all makes a pretty good picture of real life ;). totally neglected to write ANYTHING down. Should I keep going? Help. A : Don't despair. Keep going. Maybe your book will just document your life in photos and you can add thoughts/observations/etc when you put the album together. Again, there is no right or wrong way to complete this project. Feel free to continue commenting and sharing here. I will be around today to answer questions in the comments section. Cool ideas! My middle schooler is easy and I have no problems it is the high schooler. She has the typical high school stuff (cell phone-with a camera no less, ipod, laptop, etc.) but she would never have them at school. We are going to a lecture at Reed College this evening for one of her classes and since I get to go my camera is going too-at least I will get something in addtion to pictures of her school. Thanks and totally enjoying this. I love the idea of blogging this... maybe taking my categories and posting each for a day next week... then scrapbooking them later. I love that all of the creativity in our lives can be so interactive. Thanks for today's post - I needed some encouragement - hitting the mid-week blahs. Doesn't help that we're all sick, the fridge isn't working and the puppy chewed a good portion of the berber carpeting in my family room. BUT... I'm going to find a way to get over this hump and 'embrace the imperfection' in things - maybe I should just step back and realize that we are 'livin' it' and it's all ok.
Time to re-group and take a few photos for today. Amy - I have not had any problems with my machine gunking up. One thing I do when stitching on the plastic is force it a bit - pushing it through + keeping it moving. I am not careful :). I too am saying thank you for helping me remember the little things. Our house sometimes is very fast paced and while I might not get a picture of everything as I type up what we've done for the day, things will pop back into my head. I do have a question regarding your first picture w/Simon. Very cute by the way. The clipboards on the wall, it looks like you have 6 of them, and one is a calendar. What are the rest for different projects you are working on? I'm looking for a way to simplify my life and I like that idea but was curious as to how you use it. Peggy - each one has something different. One is a due date schedule for my Creating Keepsakes column, one holds ideas for a benefit project I taught last weekend (needs to be changed now), one has a list of things to do, one has a larger calendar that I tend to use for blog-planning, and the other is an old sheet of paper that also needs to come down. They work great :). Thank you so much for posting your everyday thoughts and photos, It's day 4 for me and today for me feels like a sluggish day (I almost wanted to give up) but just reading your posts and your answers to questions sort of pushes me to not quit. I'm a temporary stay at home mom (DH and I agreed that i would need to go back to work begining of 2009) I know when i go back to work, i can look back to this week and really appreciate that i did this. Hi. I just wanted to say for all those out there who are thinking that their week isn't a "normal" week. I was thinking of postponing the project until next week, because I celebrated a birthday yesterday (something that obviously doesn't happen every week!) and it is school holidays in NZ where I live, so on Sunday my little brother will be coming to stay, mum will be dropping him off (they live 3 hours away.) and I thought, well this isn't normal, this doesn't happen everyweek. But then I realised this is normal. My mum comes to visit about once a month, sometimes spontaneously. It is normal for our house to have visitors. And for my birthday - we went out for tea. We wouldn't normally do this weekly, but we would have normally got takeout if it wasn't my birthday (we get it once a week- Im pregnant - Im allowed hehehe). So my week is not "normal". But no week is. Every week in my year is different.Next week my brother will be here. The week after I will be staying at my mums for 2 weeks. And then when I get back, My partner is going off for a golf tournament. So if I kept on waiting and putting off this project I would never get it done. Every week is normal - in its own way. I'm wanting to use your photo overlays for the days of the week ontop of several of my pictures but i want to use them as real transparencies. I can't find any computer/printer transparency around here. Any suggestions on where i can find some online? BTW... i LOVE this project! I am panicking just a bit because I am not sure how many photos we will use per day. I have plenty that I took yesterday (that is when I started). Nancy, I think it's important for YOU to take pics of your rooms full of scrapbookclutter, but that doesn't mean you have to show it to all the world if you don't feel like it. I'm not showing all my pics online for pivacyreasons (I'm ok with people seeing me on a pic but not with pics that show exactly where I live). 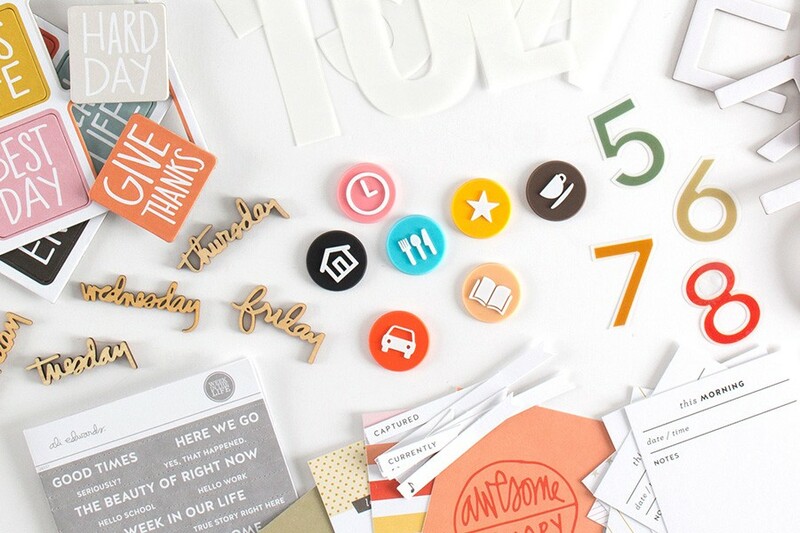 In stead of all this clutter bugging you and making you feel overwhelmed, you could use the pics from this project and the realisation that you have way more stuff than you use, inspire you to combine the pics and some of that stuff to make a cool scrapbookproject. actually using the stuff and seeing a cool result might make it easier to buy less and scrap more. Daniela - this is really going to be a personal choice for you. Some people will have a lot of photos and others less. I am averaging about 20 per day...in the past when I have done this project I took many, many more. Part of how you will decide how to put your album together will be based on the number of photos. Again, there is no right way for this project to be put together :). 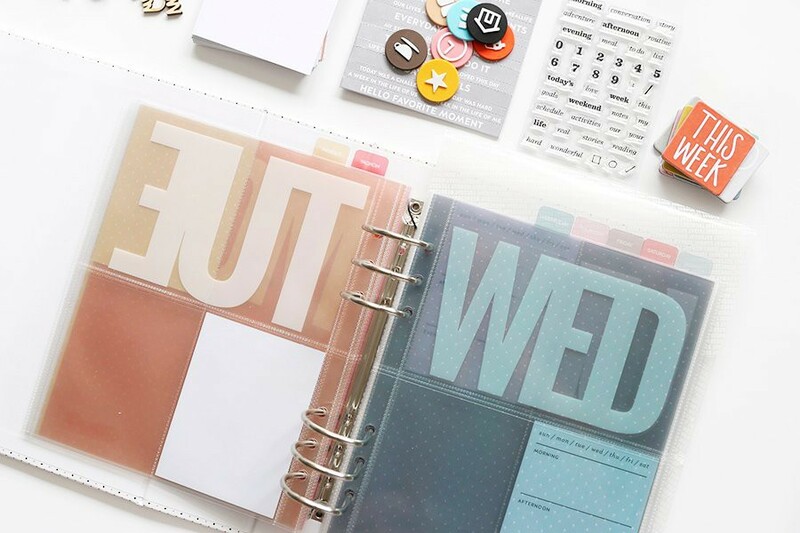 I think you can totally just use a regular binder + page protectors. I kind of feel like the odd-ball. I am 61, married and stay at home. Ever once in awhile we start new chapters in our life, some we like and some it takes us awhile to get use to. I am now in that stage of getting use to. I started last Sat. taking pictures so I am about done with that portion. I have also accumulated things for the album. I almost feel guilty because I do have the time now. You are an inspiration to me. There seems to be such a calmness in you soul. And you are soooo organized. I am proud of you. And as my kids would say to me, AH SHUCKS MOM! I think it is interesting how doing this brings up various things in our lives. For example, why do I feel inhibited taking photos in certain locations? While it started out as a way of documenting life at this stage for myself or others to look back at in the future, it is revealing areas of life or patterns of thinking that might need some reevaluation. Thanks Ali, I could definitely relate to the comment about avoiding burnout. Today I have taken very few pictures but I am ok with that. Yesterday I focused more on the morning routines. Perhaps today will be more on evening routines. For example, I haven't done any pictures of bath night and pjs yet. And I definitely need to learn how to use the timer on my camera if I'm going to have any pics of myself. Thanks for letting me join you on this journey this week. It has really given me some creative inspiration and I'm glad I'm documenting all of these moments that I haven't captured yet. Ali, I really appreciate what you said about this project allowing you to take a look at your life in terms the things that are important, what you love, what you dislike. This post came at a good time for me. I began my week on Tuesday, and though it has only been two and a half days, I found myself feeling a bit sad about my life and lamenting the days gone by. I am very blessed, have a wonderful husband and two great little ones, but I found myself feeling disconnected and out of balance with ME! I am trying not to wallow in self-pity; instead using the feelings to make little changes. It's hard though, to stay encouraged. I'm looking forward to getting the week into an altered book maybe, I'm not sure yet. I sort of feeling now like I want to documentation of the week to really speak about this pivotal time. Thanks for the project Ali and the ear to listen! I chuckle over the folks who say "is this ok?" like you are the scrapbooking police. What it also does is make me realize that we as the caretakers are also the keepers of ours and others feelings...we always want to 'get it right" whatever "it" is...sometimes a rather heavy burden!I also wanted to address the notion of the imperfect week. I am finding that I am also having an atypical week, but have already come up with a format to deal with this: I am going to do a couple of pages with a "split screen" if you will, and have the "fantasy" side and the "real life" side...because i realized right off the bat that if I waited for a "normal" week, I might be waiting awhile! Just wanted to express appreciation for your willingness to share this with all of us and cheerlead us. I am loving this experience and it is really eye-opening. I have 5 small children and I knew we were busy but this is making me look at our lives in a new way. Like you said today--seeing what I love and want to keep and what I can really let go. As fate should have it, I happened to dig up quite a few empty trading card page protectors from my son's Pokemon days, which seems a good omen for this project and some business card holder pages my husband had knocking around (I think just from Staples). Sometimes I put things through my laminator that don't fit in any traditional page protector. It means that pages can end up any size you want and the possibilities are endless! 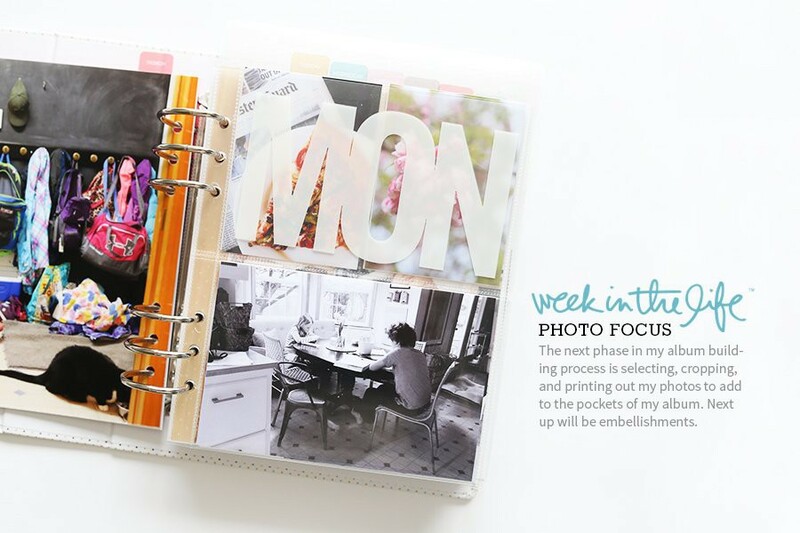 They're easy to cut to size and you just punch holes to fit them into your album or binder. Obviously, whatever is sandwiched between the plastic can never be retrieved, but it works well for odd-sized things like maybe a piece of children's artwork or a long receipt from the grocery store. It's just another option. Everyone should take note of Ali's perspective! It is so smart and so real. This is such a blessing of a project. The ISO saved my pictures too! What a smart tip. Thank you tracey, you have forever changed how I take indoor pictures! I got a really neat album at Michaels for this project. It is a 8.5/11 album, but it's horizontal! It's perfect, because I find myself taking a lot of horizontal pictures. unfortunately, i can't use the trading card protectors in this album, but i figured I would use the same idea (the grid, and the same size that each of the slots are). This project is really teaching me how to adapt. And can I tell you how much I feel like I have grown as a photographer in these short days? I have gotten so many 'oh-my-gosh-did-i-really-take-that' shots. it has really boosted my confidence as a photographer. i think my point of enlightenment was the sincere realization that i am a photographer. not just a girl taking pictures, but a true, artistic and talented photographer!! Thank you Ali, for helping me along.